Ambode did well in office, but he isn’t a good party man –Tinubu – Royal Times of Nigeria. The national leader of the All Progressives Congress, Asiwaju Bola Tinubu, said on Tuesday that though Lagos State Governor Akinwunmi Ambode has done well in office, he has not been a good party man. 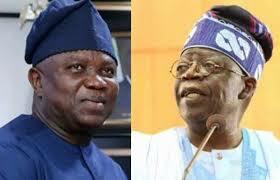 Asked why he withdrew his support for Ambode, Tinubu said, “Who did I support in 2014? Ambode. Life is dynamic. It’s those who made me the leader of the structure in Lagos who said it was what they want. It’s only if you have followers that you’re a leader in democracy.